As a school library specialist, I strive to always have my students engaged and excited about exploring new ways of learning. One of those new tools is augmented reality (AR). The challenge that many of my fellow educators face with this kind of technology is that it looks fun, but they don't have a concrete plan to incorporate it into learning on a daily basis or an idea of exactly how (or if) it will impact student learning. Here are three ways that I have discovered to help educators move from admiring AR to actually teaching with it. I'm also the head of project-based learning at my school, so I'm always looking for ways to collaborate with classroom teachers. I have an English teacher who frequents my room a lot, and AR intrigued her, so we put our heads together. She was just starting The Diary of Anne Frank with her eighth-grade honors classes, so we had her students conduct background research into what the rooms in Anne Frank's attic looked like. They found everything from the dimensions of the rooms, to the pieces of furniture, to how many people had to hide in the attic. Then they were able to recreate it all using the AR platform from 3DBear. We moved tables around, and we had kids climbing up on things, laying down duct tape with yard sticks to get the dimensions perfect and then adding augmented reality bunk beds and desks and dressers. The students were really excited about a book that can often be a challenge. My math teachers were working on different geometric shapes, so we collaborated on a lesson plan where their students would look at these shapes in three dimensions and manipulate them to get a better understanding of the different angles and all of the different concepts about the shape that they need to know. For that same shape lesson, I assigned students to find examples of each shape in the library. It got them out of their classrooms and exploring the world around them. They were finding all sorts of things that I didn't realize I had in there, like the Christmas tree that I still had out in May, which they identified as a cone shape. 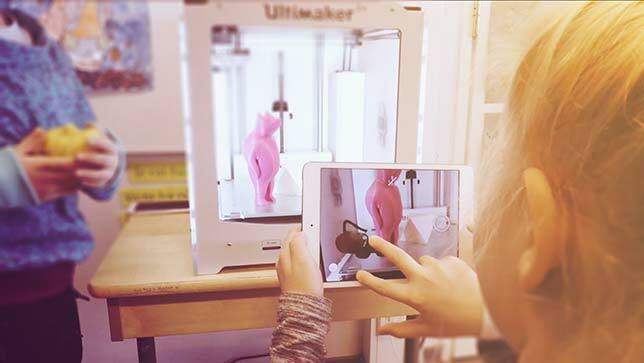 AR is a unique technology in that it really connects students to the environment around them and helps them see things in different ways. For next year, I'm planning to use our sports field as a background for our seventh-graders to use AR to recreate a battle scene from the American Revolution. There are so many different battles that our students have to know, and getting them outside and interacting with their own environment will be a lot more fun and meaningful than rote memorization. If you want to do your job well, you have to try new things and not be afraid. Using new technology puts you on a more even playing field with your students. They know you're trying something new too, so there's a spirit of "we're all going to try this together." You're engaging with your students not only in their learning, but also on a social-emotional level. It's been amazing to see how the students think augmented reality should be used. 3DBear held a contest where they asked people to tweet new ways to use the app in a classroom setting. Two of my boys submitted the idea to recreate a scene from their favorite book and ended up winning a Makerbot 3D printer for our library. As they learn more about AR, my students have started to incorporate themselves into the assignments. It's been fun to see the creative ways that they can put their own personality into lessons, whether that's making a dinosaur sit on one of their friend's heads or putting the different augmented reality pieces in their arms so they can be part of the picture. One of my students' favorite lessons was about dinosaurs. They researched different time periods and what dinosaurs would have lived in that time period. Then they used AR to place their dinosaurs in a habitat where they would flourish. While dinosaurs are not part of their sixth-grade curriculum, they were able to work on their research skills while looking at a topic that was appealing to all. My 25 sixth-graders will be seventh-graders next year, and I've told them, "I'm going to use you to try to get the teachers into AR." As is the case in many schools, some of my teachers can be reluctant to try new technology, but if I then say, "You already have three or four students in your room who know how to use this," those teachers are much more likely to give it a try, using those students as team leaders. Susan Sclafani is the librarian at Oregon Middle School and the lead librarian in the Patchogue-Medford (NY) School District. She also serves as a member of the Eastern Suffolk BOCES School Library System Council. You can find some of her lessons and insights on her site mylibraryisnotquiet.org.